An honest portrayal of an introvert. Samaria is candid about her layers on "Anti-Social." The song is a disclaimer that there will be days when she's just not feeling it and she's okay with that. In this self-directed video, Samaria emphasizes that she's on a path to self-discovery. 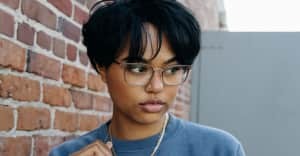 Samaria explained her connection to the song over email to The FADER. "'Anti-Social' is a very honest track, which I created with my producer DTB," she wrote. "It means that if you're going to decide to deal with me you're going to have to deal with me and all of my craziness. I am someone who used to be extremely hung up on what others thought of me, as I get older I realize more and more that no matter what you do or say there's always going to be someone with something to say." "The video reflects the same aspects. Given this is the my first time directing my own music video. I wanted to insure things be done correctly and showing that 'Anti-Social' isn't all about being alone. It could reflect lost within your self. I hope the world enjoys this visual!" Her EP The Story of Right Now is available on iTunes now. Enjoy the video above.